The Burlington City & Lake Semester is outside the usual classroom setting and closer to downtown, allowing students to easily meet with community partners. For example, students gave feedback at City Hall to officials working on a diversity initiative. A group of about two dozen teens sit on couches inside an Old North End community center, eating snacks and chatting. This relaxed setting, about a mile from Burlington High School, is where students enrolled in a new program called the Burlington City & Lake Semester gather most days to learn. It’s outside their usual classroom setting and closer to downtown, allowing the students to easily meet with community partners, such as city employees, artists, researchers and residents. 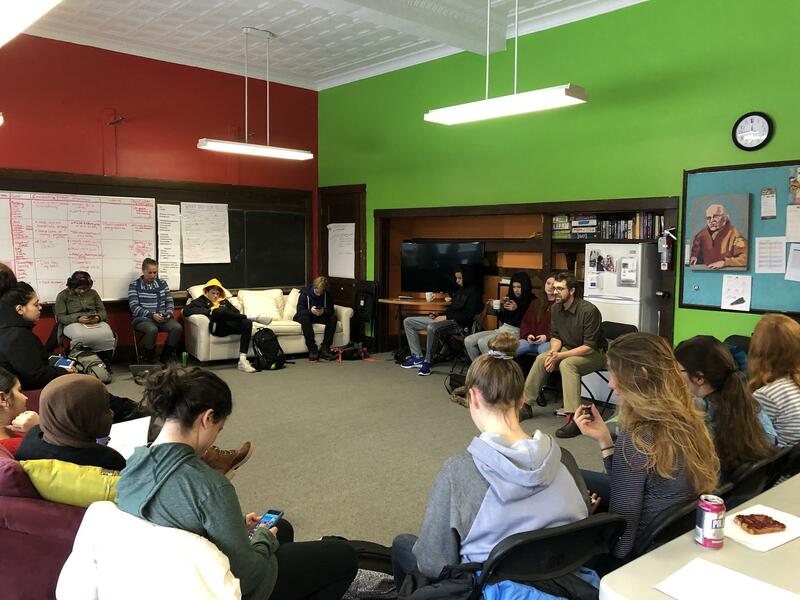 The idea of the class offering is to get authentic, real-world, collaborative experiences in and around the city of Burlington for one immersive semester. A group of students enrolled in the Burlington City & Lake Semester program gather together. There are 24 spots in the program, which juniors and seniors can apply for. Dov Stucker, a social studies teacher at Burlington High School, helped create the program along with Peter McConville. The program is funded, in part, by Shelburne Farms. Stucker said kids' voices are often drowned out by adults, but the Burlington City & Lake Semester tries to change that. “But that’s very different than keeping students at the center, especially when we think about institutional change and in this case looking at the future of the city," Stucker said. "So that was a real drive — trying to keep young people at the center, and their voices and their perspectives really in partnership with adult partners." Students have to apply for one of the program's 24 spots, which are currently reserved for juniors and seniors. Julius Dodson, a junior, said he enjoys learning about issues from multiple perspectives. Dodson and his fellow classmates in the City & Lake Semester program were invited to Burlington City Hall to give feedback to city officials working on a diversity initiative. “I love, like, the idea of place-based learning and being more attuned to your surroundings and learning about the community you’re growing up in and having a voice in it," Dodson said. "I think ... one thing that’s going to be fun about today is getting to actually make a change and, like, have an effect, which I'm excited for." Binti Malawia, another junior, said the program has allowed her to dive deeper into her learning because it doesn’t require traditional assessments. This frees Malawia up to enjoy the process of learning and she engages more with the subject — in this case, water pollution. The students are encouraged to follow their own passions and engage in research projects. All the learning, Stucker said, is interdisciplinary. “Most of the way student learning is delivered at school is relatively acontextual. It’s departmentalized, it’s just about math class or it's just about English class," Stucker said. "What we’ve done with students, and what students have experienced, contextualizes their learning. They go back to science class and say, 'Oh that’s why water quality matters.'" For their end-of-the-semester project, students planned a projection art exhibit with Mary Lacy, a local mural artist. Each student created their own art to answer the question that shaped the entire semester: What does it take for a community to thrive? Fellow students, families, teachers and others gathered to hear the answers. 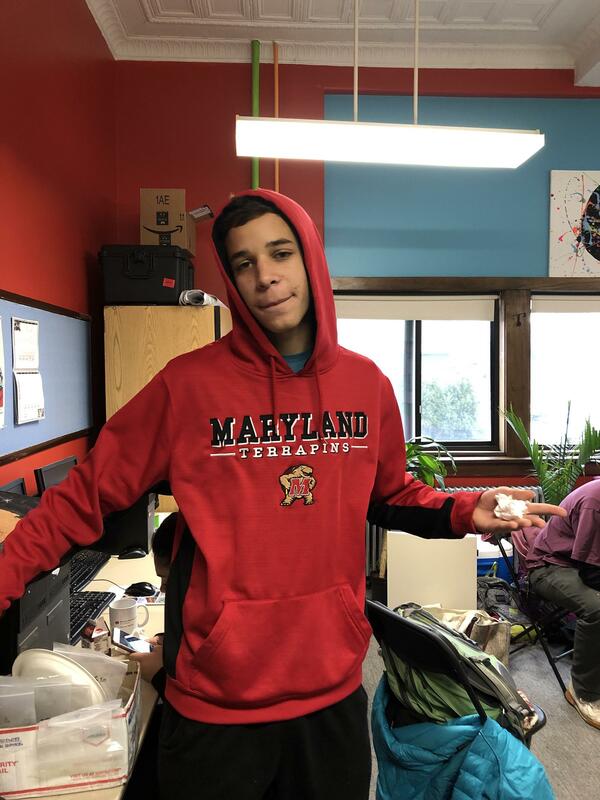 “I think a big part in having a community grow and thrive has to do with listening and taking into serious consideration what young people have to say, because they think, see and feel in different ways than grown adults,” said Famo Haji, a student in the program. The district plans to offer the program at Burlington High School each semester, adding new voices to the conversation. What makes a community sustainable? High school students in Morrisville are trying to answer that question, through interviews and art that explore the stories of local residents. One of the most influential neo-Nazis in North America, responsible for recruiting a network of white supremacists online, was operating secretly in the city of Montreal. But the bombshell reporting published in May by the Montreal Gazette came to the paper by an unusual path: after months of research and reporting by a pair of journalism students at Concordia University, Shannon Carranco and Jon Milton. Will An International Developer Get Stalled Burlington Mall Project On Track? Burlington’s downtown mall redevelopment is months behind schedule and city officials’ patience is running thin. Recently, Brookfield Asset Management — a previously silent partner in the project — took control, a move that has left officials optimistic the project could get on track.